A rainy day in Austin is like Christmas. To be able to open one’s windows, allow the breeze to come through is a rarity that must be thoroughly appreciated. 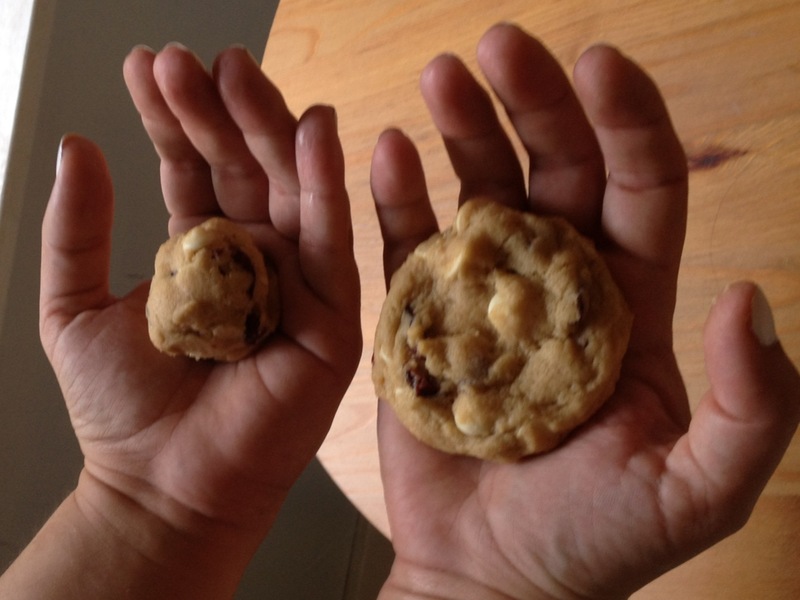 I celebrate by making cookies. I don’t like to bake sweet crap too often, but when I do, I normally do it on a Sunday so the extras can either be baked into individual servings for lunches throughout the week or just brought into the office and dumped on less fatty coworkers. Rather than making those heavy super mega chocolate cookies I normally make, I decided I wanted something lighter, fresher, something that would be great with a cup of coffee. I decided to take a usual cookie recipe and tweak by lightening the sugar and adding a little lemon, fruit, and love. Okay, not love, but I did really like the way they turned out. 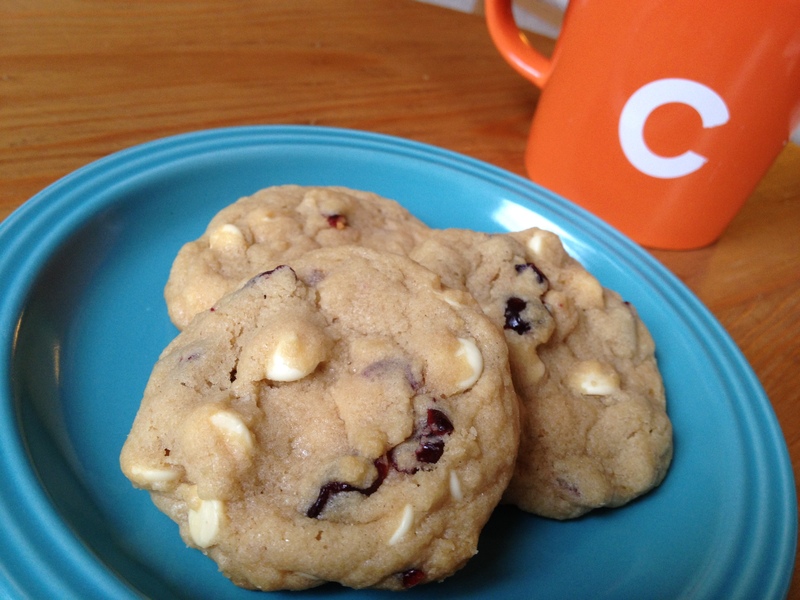 I call them Lemon White Chocolate Craisin Cookies ’cause I like the alliteration at the end there. I’m sure it should probably be something like the orange White Chocolate Craisin is a trademarked name of the Ocean Spray Company Cookies, or the much less exciting Lemon White Chocolate Dried Cranberry Cookies, but who the hell cares? 2/3 cups Ghirardelli white chocolate chips. I know, that’s pretentious, but they really are the best for baking. Preheat the oven to 350 degrees. Beat the butter and sugar until delicious creamed. Add the egg and vanilla; beat until incorporated. Add the lemon juice (and take the 2 seconds and spend the 30 cents on a reallemon for that) and zest, and whip until it’s all combined. Now at this point I’m supposed to tell you something like “In a separate bowl whisk together the flour, salt, and baking soda, then add slowly to the butter mixture…”, but I’m not going to tell you that. I made this recipe a couple of times (that’s what you do when you test and create recipes), once doing the flour and crap whisked in a separate bowl, and once at the end just adding it ingredient by ingredient. I’m going to blow your mind: It made NO difference. None. I bake to make my house smell all warm, fuzzy, and comforting, and to make my fatass fatter. Not for the delicate art of it all. SO, once you got the butter and everything else mixed, add the flour. I added it a cup first, mixing well, then a cup and a half just so it wouldn’t make a mess. Then the salt, and then the baking soda. Mix until everything is combined. Add the white chocolate and the Craisins last; I have to do this quickly or I find my friends poaching the best ingredients. My friends loved this glaze like a six year old loves Dunkaroos, but I prefer them without, or with very little glaze. Whisk everything together and drizzle lightly over cooled cookies. Or french toast. Or pork chops. Hell, it’s simple and awesome, throw it on anything. But make sure to enjoy the cookies. This entry was posted in Food, Geek Chef, Humor, Recipes and tagged bake, baking, cookie, cookies, craisin, cranberry, dessert, diet, easy, family, foodie, glaze, lemon, perfect, quick, recipe, simple, sweet, white chocolate.